From the opening seconds of Valentina Marino's acapella version of "Three Little Birds," a fun ride is already guaranteed. 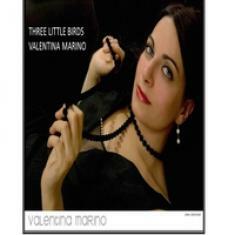 "Three Little Birds" is the perfect expression of Marino's immense musical talent. The whole track is nothing but Marino's own vocal skills, from the main vocals to the back-up to the harmony, coming into play to lay down a hip and fun rendition of the Bob Marley classic. "Don't you worry ‘bout a thing," Marino coos, and it is impossible not to agree and listen to what she has to say (or, in this case, sing). Marino's deft arrangement and creative vocals transform "Three Little Birds" into a surprisingly catchy jazz record, full of the same head-bobbing good vibes that made the original such a hit in the first place. Its sheer positivity melts whatever dark clouds are looming overhead. By exploring and tapping into the transformative power of jazz, Marino managed to create something comfortably familiar but excitingly new.